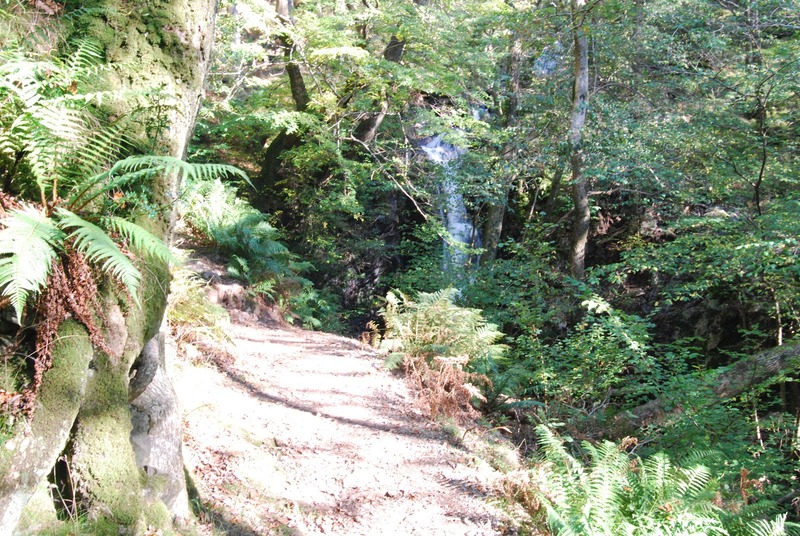 Well the waterfalls are looking magnificent at present and the leaves are starting to turn so it has to be the time to get your walking boots on and investigate the great walks all over the property. 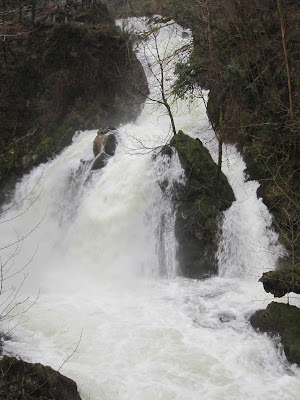 Of course most people have their favourite walk and some know the area like the back of their hands but there are always new places to visit and new experience's to undertake so here are a few ideas. The National Trust is running a national Walking Festival throughout the Autumn and we have loads of downlodable walks available on the website. We have also instald some extra large picture frames at Tarn Hows and Wray Castle so visitors can get that fantasic Gainsbourough style family potrait with a ready made stunning backdrop. Hopefully it will encourage people who visit the site to get out and give it a go and perhaps walk round the tarn while they are there. Also just recently i was contacted by the One Show to see if i didn't mind being filmed in their balloon talking about the history and creation of Tarn Hows. They did say there were a few H&S questions and if the answers were ok we were good to go, i had to give my height weight and ability to cope with heights. I must have fit the bill as i had a very enjoyable flight in a rather cramped basket over the tarn one sunny evening, with the actor Larry Lamb. The piece will be shown early in October so look out for us. Hope you can get out and enjoy an early autumn stroll over the coming weeks, I know i will be. A night on the fells. This week started with a late-night call from some friends whose trekking company had organised a three peaks challenge ascending Ben Nevis, Scafell and Snowdon in a 24 hour period. One of their guides had been taken ill on Ben Nevis and they needed a quick replacement so I agreed to guide the Scafell walk. I met the group at 1.30 am. As much of the walk took place in darkness, I have searched out some earlier photographs to show you the area. 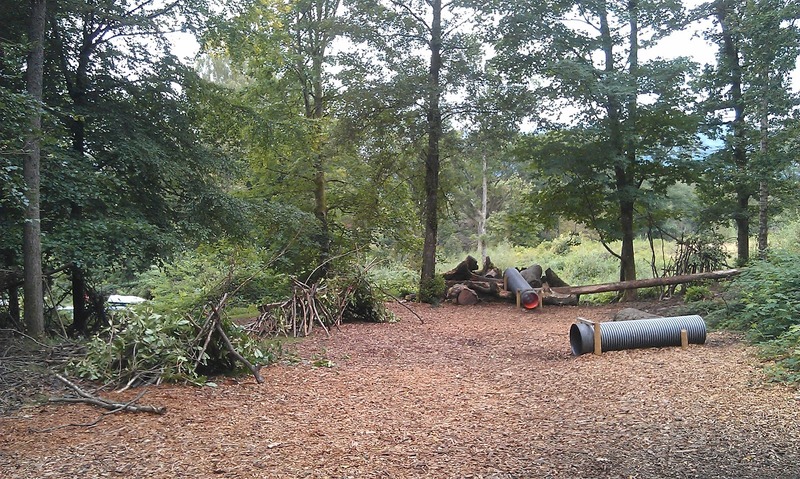 Spot the wild camp - just leave behind no evidence that you were there. We took a route behind Great End and across the boulder fields. The boulders were particularly hard walking because it was dark and there was low cloud creating a slick of moisture on them. Boulder field - can be hard going and it was for us. Scafell far right. A closer look at the boulders - John in his element identifying lichens. Summit cairn on Scafell - a familiar misty view for many! I brought the group back down the corridor route to Stye Head and on to Seathwaite. As we were circling around Stye Head the morning light was just breaking. A tired group then carried on to complete the final section of the challenge up Snowdon and I went in to work at my day job! Overall it was good to walk it at a different time of day and do some map and compass navigation. If I’m wearing the right clothing, I love being on the hills in any weather. Beginning the next stage of access-for-all path. At work we have just started a big project to construct another half a kilometre of access-for-all path along the Derwentwater shore. At present, the existing route is being quite badly eroded in places and can be up to 4 metres wide and very muddy. We are now working on a stretch on the eastern shore from the Kettlewell car park towards Keswick. This project is a win-win project. Once it has a good surface about a metre and a half wide, the path becomes accessible for push-chairs, wheel-chairs and others with mobility difficulties. It also encourages users to follow a narrower route rather than to be constantly widening the route as they try to avoid mud or puddles. The surrounding vegetation can then thrive when it is no longer being trampled. Our long-term plan is to have a complete circuit of the lake but, for such a big project, it can only be completed in stages as money becomes available. Part of the funding for this stretch comes from the National Park's Access to Water Strategy. As soon as we have more funding, we’ll move on to another length until we have the complete circuit and a superb walk will be there for us all. Since our last update we've spent a fair amount of our time sorting out the drainage on the new Helm Crag path. As you can see in the photograph below, the path takes a lot of water and if left to it's own devices heavy downpours can cause serious damage to a stone footpath. This photo was taken before we built an additional two drains higher up the path so the next time we have torrential rain the majority of the water will be removed before this point. The problem we've had with fixing the drainage is that there's a dry stone wall located right at the end of the drain stopping the flow of water. In the next photograph you can just make out the drain (halfway between the shovel and sledgehammer) coming to an abrupt end when it reaches the wall. So to allow the water to run away from the path we've had to take the wall down and incorporate a gap in the wall at the end of the drain. The following photo shows the wall after we've started to rebuild it. Putting in these drainage gaps has turned out to be a bigger job than expected. As the wall was in a poor state of repair, once we started taking it down it had a tendency to fall down on it's own. This created a much larger gap than we really wanted! After a couple of days work the wall was rebuilt up to it's original height again.﻿ So next time there's a massive downpour (which probably won't be too far in the future) we're now fully prepared for it! This last month we have been involed in numerous tasks, projects and activities, all of which have led to an extremely interesting month. 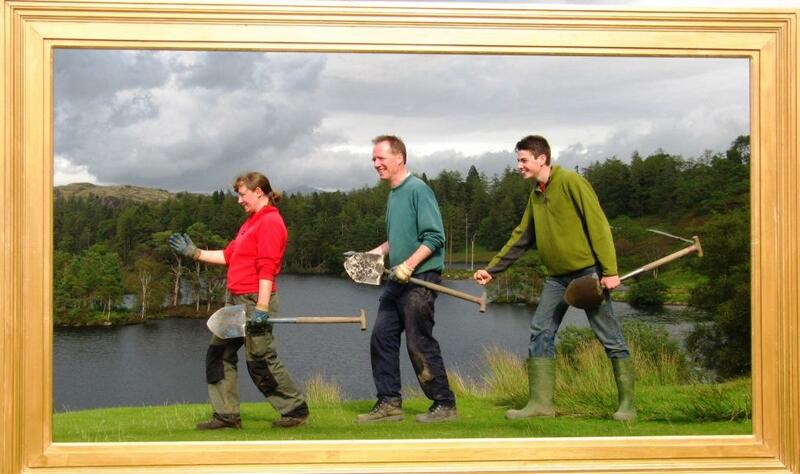 We have been involved in clearing the garden of Tarn Hows cottage to get it ready for re-let to new tenants. Relaxing after a hard day with a brew and a view! 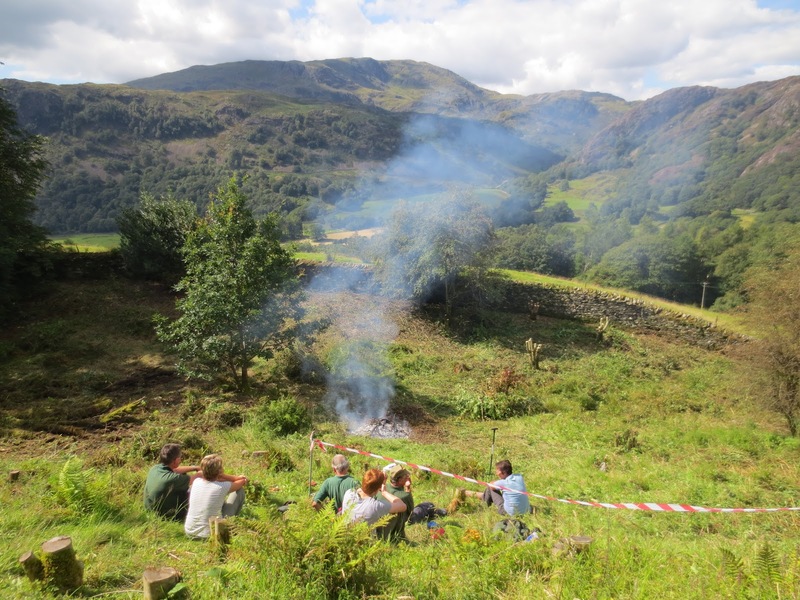 ﻿It was a hard job with loads of brambles and saplings to clear, but we had the help of our ever enthusiastic South Lakes Conservation Volunteers, with a fire and amazing views. 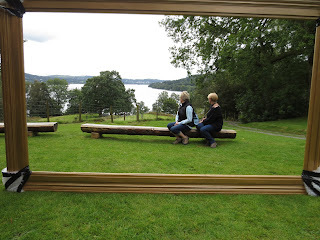 One of our tasks this month has been to erect some giant picture frames at a couple of our favourite views.We put up one looking over Tarn Hows, which has been used by many of our visitors as a quirky way to frame them in their view. We have put another at Wray Castle, looking south down lake Windermere. 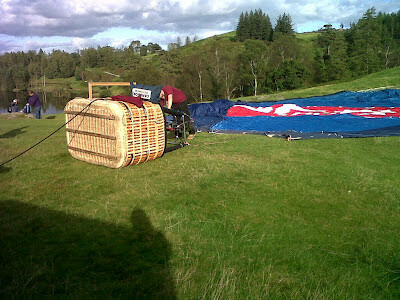 We had people testing it out before we had even finished putting it up! 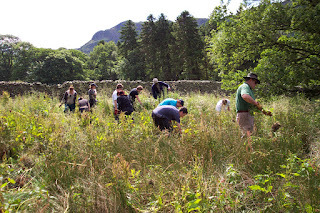 The highlight of the last month for me has been the day that I spent at Wray Castle showing kids how to build dens, it was so satisfying showing them the basics and then letting them have a go. This is just one of the activities that we have been doing there as part of the National Trust "50 things to do before you're 11 3/4" campaign. Well, that was another week of ‘will it, won’t it?’ - rain that is! Sometimes it did and sometimes it didn’t so some planned activities did take place and others were not so lucky. The dogs waiting where they saw a mink go to ground. Bottom left of the picture and the mink has resurfaced behind the dogs to watch them! I helped out with one of the lucky ones - a guided walk looking at the geology of Borrowdale. Borrowdale has a lot to interest keen geologists including the Skiddaw slates, the Borrowdale volcanics, a number of metallic mineral deposits ... and of course the famous graphite (or black lead, black cawke, wad, plumbago as it is variously known). There’s also the evidence of Neolithic settlement. At some time in the 16th century a discovery of a large graphite deposit on the approaches to Grey Knotts from Seathwaite was the trigger for two important developments. The first was the development of the world’s first pencil industry – an industry that continues to this day although it no longer uses local graphite. More important in the 16th century was its use in lining the molds to make smoother cannon balls that could be fired further. As the monarch of a maritime nation that made much use of cannon balls, Elizabeth 1 exercised strict controls over this valuable resource and the Crown monitored all aspects of the mining. The mine was guarded day and night by armed guards. Despite that, there is evidence that some individuals took the risk and profited from illegal activities! This is where the saying the black market comes from. The weekend was not so lucky with the weather and the annual Borrowdale Show turned out to be a rather soggy event. At the Trust we had prepared a display of our work in Borrowdale. Either it was very popular or a lot of people were taking advantage of the shelter we provided. A decision has already been made to cancel a Buttermere Fun Day that was to take place on September 23rd– the field is too muddy. The photographs today are of some of the wild-life around here – there’s a limit to how interesting pictures of muddy fields can be! Use your feet to show your love of the Great British Countryside this autumn. Take part in our Great British Walks. Pristine wilderness or post-industrial site? The hidden history of a nature reserve. What to bring and what to wear: Bring food and a drink if required. Please wear stout boots or shoes and bring waterproofs. Suitable for: Mostly moderate but with some uneven terrain over sand dunes, shingle and grassland. May involve crossing stiles. Children are welcome if accompanied by an adult who will remain responsible for them at all times. Please note that in the event of severe weather or other safety issues events may have to be cancelled, shortened or changed on the day. Jobs could include scrub bashing, pond vegetation removal, repairing of boardwalks and fencing. What to bring and what to wear: Bring a packed lunch and drink. Wear old clothes, stout boots or wellies and bring waterproofs if needed. We recommend that all conservation volunteers have an up to date tetanus inoculation. Suitable for: Anyone with a reasonable level of fitness. Children are welcome if accompanied by an adult who will remain responsible for them at all times. Please note that in the event of severe weather or other safety issues events may have to be cancelled, shortened or changed on the day. We Provide: Tools, gloves, hot drinks and biscuits. We also have a limited supply of wellies and basic waterproofs that we can lend to volunteers. Apparently, it’s been the wettest summer for 100 years. Not since records began though, that was 1910 – makes you wonder what 10/11 were like ….. The campsite on a clear morning. The sort of view you only get when you're on the hills for the night! As usual, two of our rangers camped up there with them. Myself and Sarah from the upland path team walked in and out to site every day, an important role as we can bring up forgotten sleeping bags, extra food etc if needed. The first few days weather weren’t too bad, with a particularly fine evening for the campers on the first day and any rain on the others only coming in when everyone was safely tucked up in their sleeping bags for the night. Probably won't need any more food - leader Di with the supplies before setting off. The last day however, was a bit different. I woke at home to the sound of rain lashing against the window and it didn’t stop all morning. Sometimes on these holidays this last day is quite productive with everyone working till early afternoon before heading down to civilisation. By the time Sarah and I got to site this time though, all the tents were packed up and the work site was having a last tidy up – everyone was ready to go. It didn’t leave much for us to do but turn round again and head back down, but there were plenty of heavy bags and equipment for us to give a hand carrying so it wasn’t a wasted trip. Big splat of mud, right in the face .... brilliant! Despite this rather hurried departure, the holiday was pronounced a great success by all involved. The volunteers all had a great time and were exceptionally cheery – just a bit wet – and we were very pleased with the progress made on the path. The baton will be handed over to the upland path team in September too as they’ll be going to the same site with another working holiday. They’ll not be camping though. Just goes to show that bad weather may be able to stop play, but it’ll only ever delay the ongoing work of looking after our precious upland environments. Posted by Rob Clarke, Community Ranger at High Wray Basecamp volunteer centre. I say summer, it doesn't feel like we have had one this year the weather has been terrible. We had a really good spring and folk were saying what a good summer we were going to have but they could not have been any further away from the truth. Still we have work to do and we just have to get on with it, rain or shine. Back in May we used a helicopter to lift some materials into High Force for some major footpath repairs, this is the only way to get the materials in due to the lay of the land. It’s a pretty expensive operation, £1100 per hour just for the helicopter but the work needs to be done. The helicopter was in the area being used by the National Trust to fly stone for other upland footpath projects. Firstly we have to get the bags filled a few days before; here the fell rangers are filling 25 bags with stone to build some steps, the materials were brought in by wagon to this car park which was ideal to have the lift from. They have to pick out the best stone by hand and put it in the bags which was hard work. As well as the 25 bags of stone we filled 75 bags with gravel to resurface the paths, luckily we could do this with a mini digger which speeds the job up a bit. Neil, our Ranger from Langdale has the ticket to use one so he came and helped us. Luckily the day of the lift was perfect, clear blue sky and not a breath of wind. All the Central and East lakes Rangers came to help marshal the footpaths and the road around the site, as you can imagine health and safety was a major concern with lots of walkers about and a helicopter carrying nearly a ton of stone above. As planned every thing went perfectly, it took about 5 hours to get all the bags flown in on site ready for us to get on and maintain the footpaths. 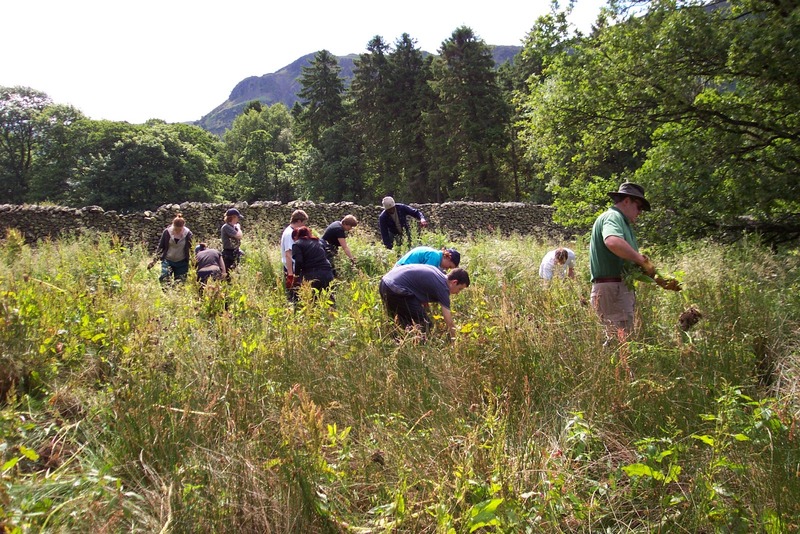 During July we had our working holiday, 11 volunteers signed up to come and help us with our conservation work for a week. 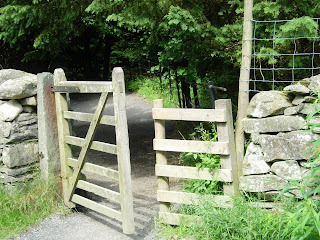 They stay at High Wray base camp and travel by mini bus to Ullswater. This year as previous years we got stuck into Himalayan Balsam pulling, this is an invasive plant that was introduced into Britain in 1839, it escaped from gardens and quickly colonised river banks and wet areas. It is an annual plant and can grow up to 3m tall and each flower can produce hundreds of seeds and when the seed pods mature they explode scattering the seed for up to 7m away. Pulling the plant out and breaking it up is a good way of controlling it, it will only grow from seed so if we can stop it seeding we should be able to eradicate it. The volunteers also helped us carry out some footpath resurfacing at High Force; we used some of the gravel that the helicopter flew in earlier in the year. Firstly we had to put an edge in along the side of the path; it had been eroded away over the years from all feet that had walked along it. Then we could lay the gravel on the path. Here the volunteers are loading the tracked barrows ready to take the gravel to the path; these mechanical barrows are a life saver, it would be impossible to push a normal barrow. This is a finished section of path ready for the thousands of visitors we get here. 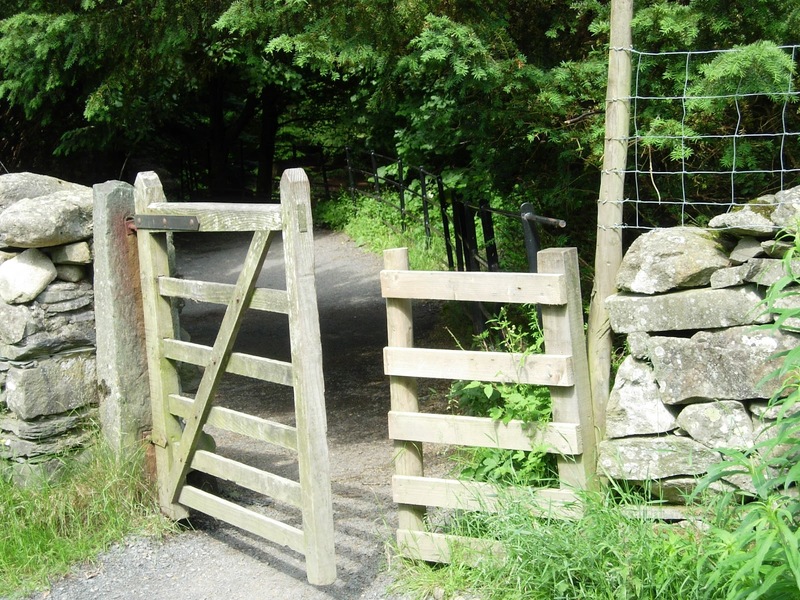 Other work we did this summer was replacing a wooden gate entrance into Aira Force with an iron one. Over the years we have been replacing wooden gates and handrails with iron which will enhance the feel of this Victorian landscape also they will last for a long time with less maintenance. Richard Airey our local black smith has done all our iron work in Aira Force including the iron seats in the glade area. Here is the wooden gateway before we changed it. We thought while we were changing it we would widen the gateway a bit to help get machinery in so we took the wall down and moved the stone stoop back. It wasn't as easy as we thought it went a long way into the ground! Once the stoop was moved and the wall put back we hung the new iron gate and put in a new slamming post, this is the post the gate closes too. We have made this removable by cementing a sleeve in the ground that the post will slide in and out of so if we need to get any wider machinery in we can lift it out. The finished job, I think it looks a lot better. While Richard was here we altered some railings and replaced a wooden rail with iron. This is the man himself, he does all the welding on site. He does a good job and likes things to be perfect just like us. The iron hand rail after. We've had a busy summer so far, lets hope we get a good dry Autumn. It's not all bad weather! It was recently summer holiday time and Jan & I have been away cycling again to the Netherlands. This time we took a ferry from Newcastle to Amsterdam. Cycling in the Netherlands is incredibly easy with its many miles of traffic-free, well-maintained routes plus its quiet country roads that are relatively free of traffic. We usually saw more bikes than cars. We cycled up the coast then back through Germanyand across the Netherlandsto Amsterdam. Even cycling in the city is enjoyable and feels safe in a way I haven’t experienced in a UK city. We find that cars in many parts of Europe seem to have more respect for cyclists. The weather was also good so we had a great holiday. ... but there's always a place for a bit of improvisation ! Fortunately we had no gales! Rural building with character - if you need more space, just raise the roof! It was good to return to the Lakes though. Back at work, one of my first tasks was to erect in Crowe Park the temporary installation you can see in the photographs. It is a 10 ft by 6 ft ‘picture frame’ and, as you can see, it frames some stunning views across Derwentwater and down Borrowdale. So far, feedback from members of the public is very positive and it is being well-used for some holiday photos with a difference. I’m biased of course and think that Borrowdale is the best bit of the Lake District! At the weekend I did more cycling with a couple of friends. We managed to fit in one of the shorter routes from west to east coasts - 145 km from Gretna via Kielder. We chose that route so that we could avoid busy roads. And finally, the next stage of planning a wild-swim event took place when I with some colleagues actually did the swim as a trial run. That’s another step closer to being able to organise such an event for members of the public. Stake Pass is an ancient route linking the valleys of Langdale and Langstrath and is on the Cumbria Way walking route. In recent weeks the South Lakes Upland Footpath team have been continuing a project on the North side of Stake Pass. There were erosion problems on this route and the aim has been to repair the erosion and create a sustainable path. The path zig-zags into the Langstrath valley and this project started in 2009. The path created is a "subsoil" path and relies on compacted subsoil material to create a hard wearing path surface. This differs from a lot of path work in the fells which relies heavily on rock. The subsoil surface is the last part of the process and there is work to do before this stage. A band of turf is first removed and there is lots of work re-shaping the ground to create the path shape with a drainage ditch above. It can be labour intensive! During the "construction" work we look out for the hard subsoil and collect it to use for the final surface. Once the path shape is created the turf is replaced on the sides and adjacent slope. The final subsoil surface can then be applied to complete a section of path.